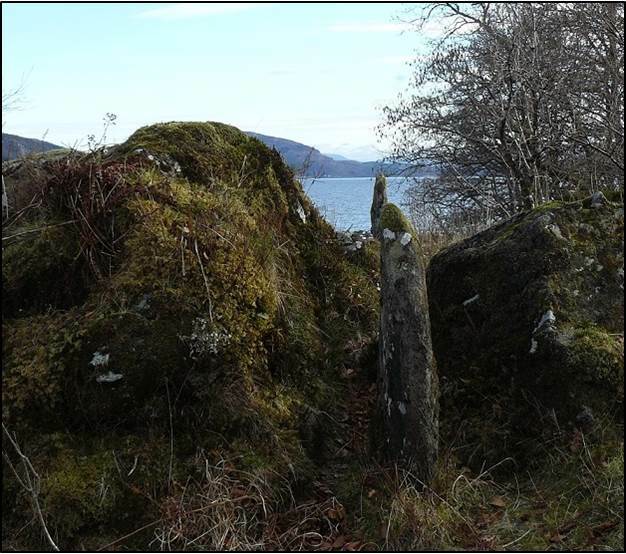 This site in Argyll was investigated by Euan MacKie 1n the 1970s. (Records in Stone, ed. Ruggles (1988), pp213-15). The site is becoming overgrown, but the essential features and the alignment can be seen. The two upright stones indicate a distant region to the north east near where the sun set about 1800 BC. Euan MacKie’s original drawing, in which he chose the upper limb. 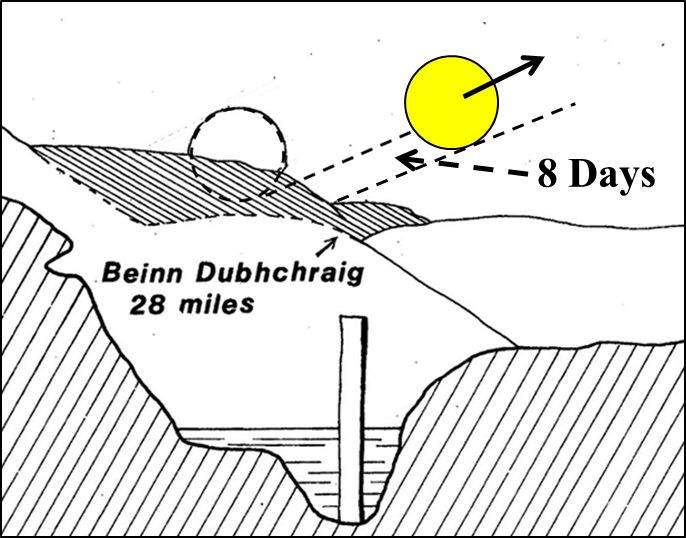 This would be at the foresight about 15 days before/after the solstice. It is probably equally valid to use the upper or lower limb. However in most of the following examples, and as explained in the Introduction, in most cases only one limb passes the foresight and must therefore be for less than 12 days. 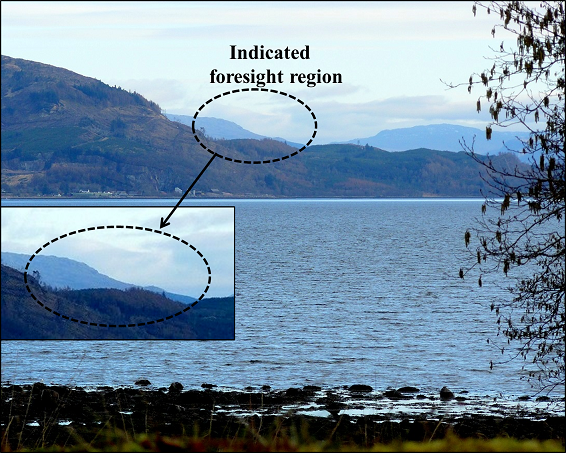 Where both limbs pass the foresight, as here, there is a choice. If the lower limb was used it would give the more typical value of 8 days. 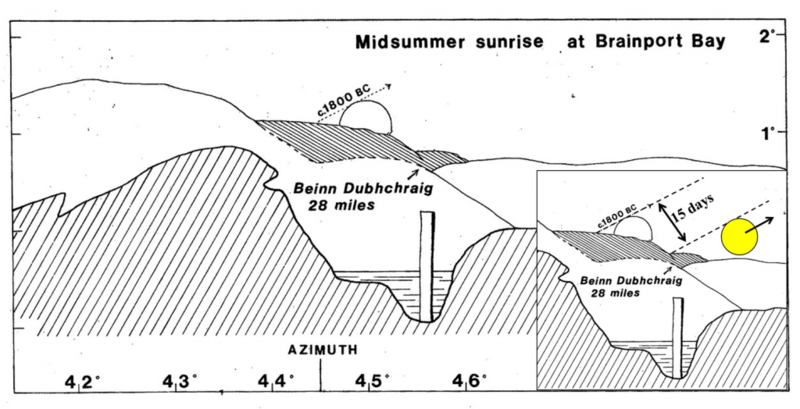 There is discussion and photographs of the site in Ruggles, Astronomy in Prehistoric Britain and Ireland, 1999, pp 29-34.